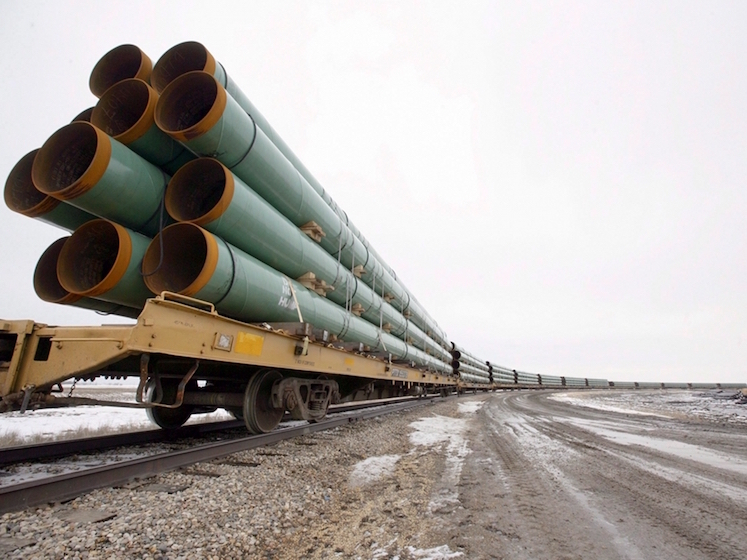 What’s Next After Keystone XL? The rejection of the Keystone XL is a victory for the planet. But it's also a reminder of how much more needs to be done. Obama’s presidency began with a 2009 Nobel Peace Prize, granted in no small part to lure him to that year’s United Nations (UN) climate negotiations in Copenhagen. The 2009 talks were greatly ambitious, with the world’s environmental ministers and advocates believing that the replacement of George W. Bush would allow for a binding global treaty to stop global warming. But those ambitions were unrealized, and frankly unrealizable — as it turns out, the cartoonishly anti-science and oil-drenched swagger of Bush-Cheney were not actually the only thing keeping the great global ship of extractive capitalism on a course toward civilizational destruction. It also turns out that the thousands of very earnest and intelligent functionaries who engage in international climate diplomacy aren’t actually at the global tiller. Despite the Copenhagen collapse, the talks continue, the challenge unsolved. In his resigned rejection of the Keystone XL tar sands pipeline on Friday, President Barack Obama cited the importance of the international climate talks taking place at the end of the month in Paris. His decision was an admission that the activists — the environmentalists, scientists, landowners, indigenous people, youth — had won, that they had beaten the oil industry and its incestuous political network of lobbyists, pundits, and financiers. For Obama, the political cost of approving a carbon bomb on the scale of fifty coal plants had finally become too high. He had also managed to wait on a decision long enough for the fortunes of the fossil-fuel industry to be at a temporary ebb, easing up the pressure to drill, baby, drill, to dig faster and deeper for ever dirtier and more extreme carbon, the carbon exploitation that keeps the global capitalist engine spinning ever faster. Obama’s speech incoherently reflected the conflict we face as those in power try to avoid collapse without changing anything about the system — he dismissed the importance of the pipeline while admitting its importance; he celebrated cheap gas and increased domestic drilling while saying we needed to hasten the transition to renewable energy. We must move as fast as possible, but not too fast! Hope, change, status quo! With one teensy tweak — as Obama well knows, it is actually nearly all fossil fuels that need to stay in the ground, starting now — this would actually be an accurate and succinct summary of the climate challenge. First is the problem of subordination. As Naomi Klein pointed out in This Changes Everything, the price of free trade is unchecked climate change. The 1990s — the decade during which the world community needed to grapple with climate pollution — instead became the free-trade decade, unfettering the global fossil-fuel economy as never before. Unfortunately, the vast majority of the participants in the climate talks — the bureaucrats and civil-society advocates — don’t want to recognize that they’re actually at the kiddie table while the adults — the capitalists — build a system that accelerates the climate catastrophe they’re trying to prevent. Examples of this reality abound: as Obama was rejecting Keystone XL, his administration was releasing the text (on a corporate website) of the Trans-Pacific Partnership, the next round of secretly constructed agreements designed to give multinational corporations immunity from the restrictiveness of societal goals such as a habitable planet. It is critical that climate activists recognize that the Paris talks are necessary but not sufficient. We must demand that all international negotiations recognize the supremacy of the climate crisis and work to claw back power from the multinationals. Without any customers, even the most efficient global corporate entity will have trouble delivering shareholder return. Second is the disconnect between public and actual power. The conceit of the UN is that the world’s heads of state represent the sum total of humanity’s governance (there is also the conceit that each nation carries with it one vote). But the heads of state who all gathered in Copenhagen and will come together again in Paris don’t in reality have the political power officially vested in them to take the action needed to constrain “private” business. Those limits manifest themselves uniquely in each nation; in the United States, the president’s power is constrained by Congress, and the fossil-fuel industry has enjoyed veto power over the legislation through a lockstep GOP and a strong fossil-friendly Democratic bloc. Obama needed to come to the negotiating table with anything more than a cheerful smile. In other countries, petro-power manifests itself differently. But one common thread remains: most of the nations at the talks have less power than the multinational industrialists that send representatives to the talks, to guide and prod and obstruct. Extractive capitalists have tremendous and deeply entrenched influence over our political systems that one conference isn’t going to overturn. The talks are an excellent accountability mechanism for political leaders; in Copenhagen, they were literally locked in the same building, with the world’s eyes on them, and didn’t leave until they came out with some agreement. But the CEOs of the investment banks, of the oil giants, don’t face the same public accountability, so they can wield influence from afar and in the shadows. There’s a growing effort to respond to this reality, including campaigns to ban fossil-fuel companies from the climate talks. This effort is modeled after the exclusion of tobacco companies from the negotiations that led to 2005’s Framework Convention on Tobacco Control, and even if not directly successful, helps draw attention to their power over global society. Finally, we’ve already violated the one mission of the climate talks. We have, as a species, failed to prevent “dangerous anthropogenic interference with the climate system.” The unrestrained growth in the global fossil-fueled economy since 1992 has been powered by a tremendous surge in global greenhouse pollution, with destabilizing effects felt in every corner of the world and every aspect of our climate, our weather, our forests, and our seas. Today’s negotiations — twenty-five years later — are still structured to address the 1990s goal of “mitigation,” that is, the decarbonization of the global economy, rather than “adaptation,” or the much more complicated problem of surviving the disruption of conditions amenable to advanced civilization. Today, the climate-change problem set includes not only the replacement of hydrocarbon power with renewable power and the reversal of deforestation, but growing armed conflict, failed states, mass migration, and refugee populations that come as inevitable consequences of the agricultural decline, extreme-weather humanitarian disasters, fisheries collapse, biodiversity loss, drought, famine, and fire fueled by the carbon pollution we failed to check. At the beginning of Obama’s presidency, the Copenhagen talks — which were expected to achieve a global treaty but ended with a framework for voluntary commitments — were seen as a failure. Given that human civilization needs a global regulatory structure to rapidly phase out the fossil-fuel industry while ensuring flows of capital and resources to developing countries from those which built their wealth on carbon, that assessment was fair. The planning for Paris 2015, which this White House sees through a legacy-setting lens, is a tad less ambitious — only voluntary pledges are on the table. This honestly reflects the limited political power of the UN climate negotiations. As of yet, these non-binding pledges don’t reflect the necessity of ending our use of fossil fuels as fast as humanly possible. Nor is there a coherent plan to ensure the capitalist drive is made subordinate to our common survival. The best the Paris talks can likely do is provide activists with an opportunity to reshape the expectations of the national electorates and build a globally connected movement. End the ideological and effective supremacy of corporate profit above all. The problem with the UN climate talks is not that they are too ambitious, but that they are not ambitious enough. Brad Johnson is the author of a forthcoming book about the climate movement. The rejection of the Keystone XL is a victory for the planet. But it’s also a reminder of how much more needs to be done.